The New York City Police Department (NYPD) is appealing for information after a horrifying homophobic attack left a young woman with a fractured spine. 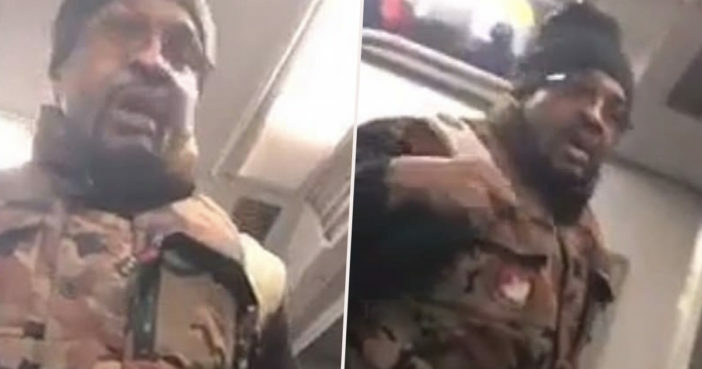 Police say a man travelling on a Manhattan-bound New York City subway train physically attacked a 20-year-old woman after another female kissed her on the cheek. The man became enraged, all because he perceived the unnamed woman to be a lesbian. He began an argument, where he referred to her using the homophobic slur ‘d**e’. When she attempted to walk away from his verbal abuse, the man followed her. Approaching the victim from behind, the perpetrator reportedly punched her in the back of her head; pushing her to the floor as she turned to walk away. This caused her to hit her head. The man proceeded to flee from the scene on foot from the Forest Hills 71 Av station. The victim was taken to the nearby Elmhurst Hospital Center where it was discovered her spine had been fractured during the fall. The incident took place on an E train in Queens, at approximately 5.10pm on November 30, 2018. Police have since released the disturbing footage, alongside a still image, in the hope of locating the attacker and pressing charges. As reported by CBS New York, the incident is being treated as a hate crime and is currently under investigation by the NYPD’s Hate Crime Task Force. The man in question has been described as a black male between the ages of 50 and 60, with an approximate height of 5 foot 11. He is thought to weigh about 220 pounds. The footage shows him wearing a black long-sleeve turtleneck beneath a camouflage patterned vest, alongside grey coloured pants. He can also be seen to wear a black beanie hat and glasses. All hate crimes are serious incidents and are treated as such by the Police Department. Crimes that are motivated by hate are vigorously investigated by the Hate Crime Task Force. Our thoughts are with the victim of this devastating and deeply ignorant act of violence.